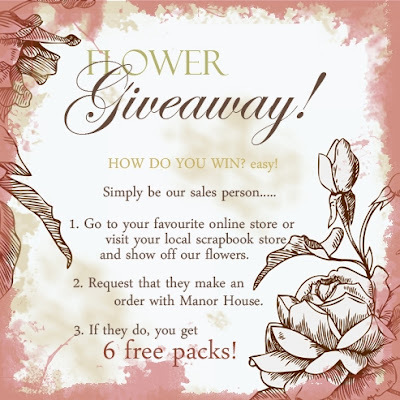 Manorhouse Creations are having an amazing give away. 6 free packets of the most stunning flowers! 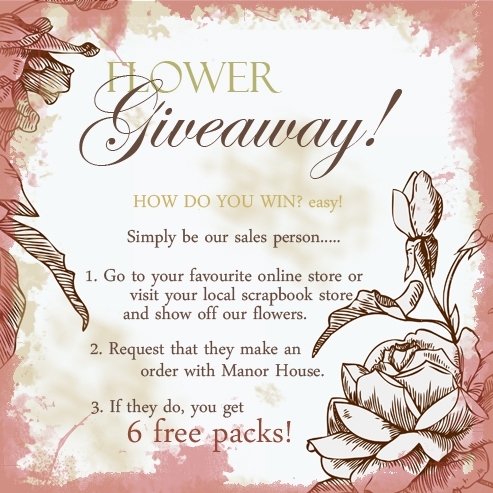 All you have to do to win, is get your LSS to make an order, email us telling us which store you requested our flowers at sales@manorhousecreations.com & we will send 6 extra packs for you to collect next time you order from, or visit, that store. This offer is open to both Australian and international customers. Today was a big day as my first dt package finally arrived filled with the most beautiful MHC blooms and Scrapcake paper lines. What a great give away. You'll get to see them IRL. I'll be back soon with some peeks. Can't wait to see what you create, Jeni! Isn't it like Christmas or your birthday when some wonderful scrapbooking products arrive?!! hi Jeni!I would like to ask you to join a little game. it is called "from what a beetle comes". it has no prize but fun. you have to show your first LO so that everyone knows from what your style gronwed. :) it would be a honor for me to see your first pages and to see how your style develpoed. to see the differents what kind of technics, colors you used in te past and now. I hope you couéd understand me. :) have a nice day.